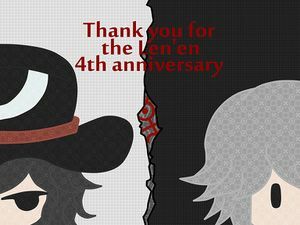 Len'en anniversaries are celebrated every year on the 11th of November, because this is the date the Len'en Project was born, in the year 2013. Usually during this time of the year, JynX will post an illustration on pixiv and thank the Len'en fans for all their support towards the project. So far, they've created four illustrations, along with a transcript of a conversation amongst some of the Len'en's characters. On 10th November 2018, one day before the 5th anniversary, Rei drew attention to two Twitter accounts, those of Hal & Hoojiro Shitodo, and had a small conversation with them. On the day of the anniversary JynX uploaded a video in celebration, teasing upcoming merchandise and even a music CD. Main article: Len'en Project 5th Anniversary Video! I drew this on Len'en's fourth anniversary~! I'm living working hard so that Len'en can continue for an eternity. 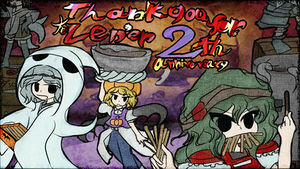 Thank you for celebrating Len'en's third anniversary! It was long, yet quick (cold-eyed). I gave it to theeeem. In celebration, I managed to create a Halloween ending-like image of Brilliant Pagoda or Haze Castle. The New Emperor Team tries to profit by selling Halloween candy at the event. 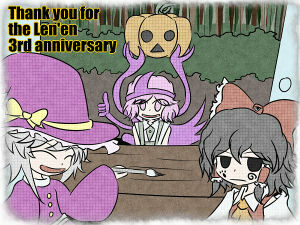 In celebration of Halloween and Len'en's second anniversary, I included both Pocky and Pretz here. It would be nice to finish the new work as soon as possible (other people affairs). This page was last edited on 13 November 2018, at 03:14.